The Museum of Modern Art and MoMA PS1 invited Matthew Baird Architects and four other young architecture firms to generate a series of design strategies to help address the inevitable rising water levels within New York Harbor. Focusing on the Bayonne and Kill Van Kull shipping route area in New Jersey, Matthew Baird Architects’ proposal engaged the architectural relics of industry to create unforeseen building types and unanticipated programmatic occupations, imagining a terrain where submerged piers and petroleum facilities become active pieces in an evolving landscape. 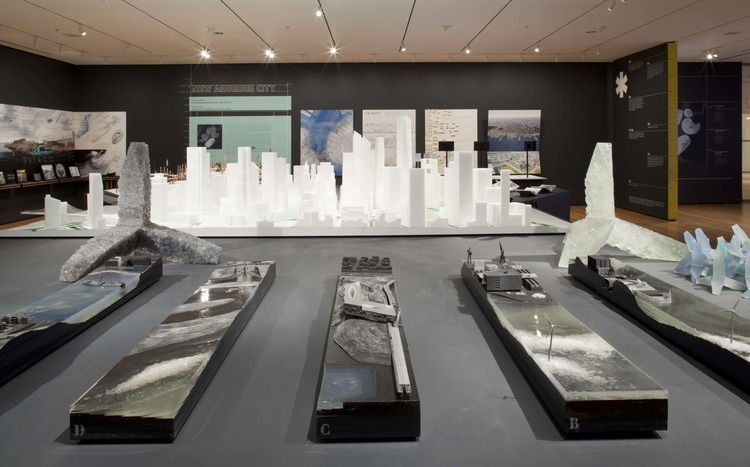 Glass reefs created by the accumulation of modular glass “jacks” cast from locally-recycled glass waste become a home where New York’s water-based ecosystems can grow, replenish, and flourish.